This week we have a subtle beauty of a card from Laurie Willison. Love how she places the focus on the gorgeous sentiment! 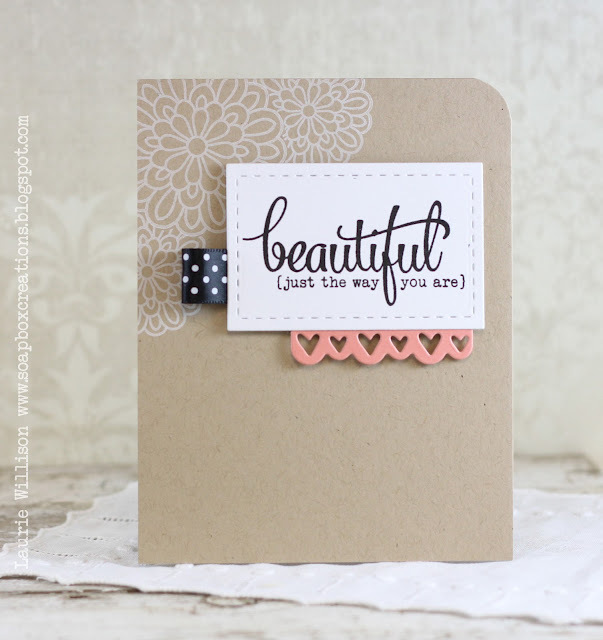 The open space at the bottom of the card really allows the focal point to shine. If you missed the voting results for challenge #6 please scroll down to the previous post. Laurie's card is so pretty! Oh what a beautiful card Laurie!! I am already inspired! Can't wait to play along!! Fantastic card !! I'll be playing again for sure...LOVE this challenge and love how it's teaching me to create CAS cards!! Gorgeous card by Laurie. So glad to have found this fun challenge! Laurie never disappoints and here she has presented us with another sensational card! Thank you!! Beautiful. ;-) Laurie's cards are always a wonderful inspiration to me. Woohoo! Finished up my cards, just in time!! I loved this design so much that I make two cards and then could not decide which to add, so I shared them both!! It will be hard to vote, but I sure will look forward to it!! So many fabulous cards.....I voted today -- but it was a hard choice! !